There is a renewed interest in better conceptualizing trajectories of attention-deficit/hyperactivity disorder (ADHD) from childhood to adulthood, driven by an increased recognition of long-term impairment and potential persistence beyond childhood and adolescence. This review addresses the following major issues relevant to the course of ADHD in light of current evidence from longitudinal studies: (1) conceptual and methodological issues related to measurement of persistence of ADHD, (2) estimates of persistence rate from childhood to adulthood and its predictors, (3) long-term negative outcomes of childhood ADHD and their early predictors, and (4) the recently proposed new adult-onset ADHD. Estimates of persistence vary widely in the literature, and diagnostic criteria, sample characteristics, and information source are the most important factors explaining variability among studies. Evidence indicates that ADHD severity, comorbid conduct disorder and major depressive disorder, and treatment for ADHD are the main predictors of ADHD persistence from childhood to adulthood. 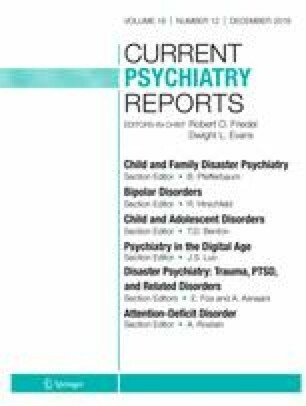 Comorbid conduct disorder and ADHD severity in childhood are the most important predictors of adverse outcomes in adulthood among children with ADHD. Three recent population studies suggested the existence of a significant proportion of individuals who report onset of ADHD symptoms and impairments after childhood. Finally, we highlight areas for improvement to increase our understanding of ADHD across the life span. Arthur Caye, Anita Thapar, Margaret Sibley, Louise Arseneault, Janni Niclasen, and Terrie Moffitt declare that they have no conflict of interest. James Swanson reported receiving research support, advisory board membership, speaker’s bureau membership, and/or consulting for Alza, Richwood, Shire, Celgene, Novartis, Celltech, Gliatech, Cephalon, Watson, CIBA, UCB, Janssen-Cilag, McNeil, and Eli-Lilly. Lily Hechtman has been on advisory boards and a speaker for Shire, Jannsen, Ironshore, and Purdue Pharma. She has also received research funds from Purdue. L. Eugene Arnold has received research funding from Curemark, Forest, Lilly, Neuropharm, Novartis, Noven, Shire, Supernus, and YoungLiving (as well as NIH and Autism Speaks); has consulted with Gowlings, Neuropharm, Organon, Pfizer, Sigma Tau, Shire, Tris Pharma, and Waypoint; been on advisory boards for Arbor, Ironshore, Novartis, Noven, Otsuka, Pfizer, Roche, Seaside Therapeutics, Sigma Tau, and Shire; and received travel support from Noven. Luis Augusto Rohde was on the speakers’ bureau/advisory board and/or acted as consultant for Eli-Lilly, Janssen-Cilag, Novartis, and Shire in the last 3 years. He receives authorship royalties from Oxford Press and ArtMed. He also received travel awards for taking part in the 2014 APA meeting and 2015 WFADHD meeting from Shire. The ADHD and Juvenile Bipolar Disorder Outpatient Programs chaired by him received unrestricted educational and research support from the following pharmaceutical companies in the last 3 years: Eli-Lilly, Janssen-Cilag, Novartis, and Shire. Doernberg E, Hollander E. Neurodevelopmental Disorders (ASD and ADHD): DSM-5, ICD-10, and ICD-11. CNS spectrums. 2016:1–5. doi: 10.1017/S1092852916000262.